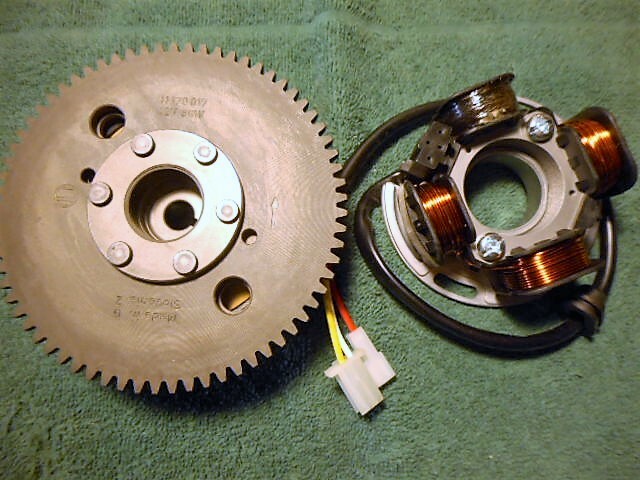 Ducati Elettrotechnica Microfarad magnetos, 94mm id flywheel, were on 1974-1982 Tomos (early A3 engine), 1970’s Morini S5K2 (Marina Mobili part number 29-0026), and maybe others. 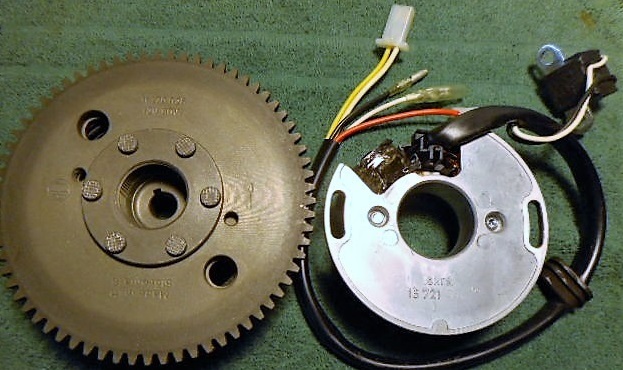 ZEM magnetos, identical to Ducati, 94mm id flywheel, were on 1983-85 Tomos (A3 engine). ZEM is a remake of DEM (Ducati Elettrotechnica Microfarad), because it is identical. These magneto-generators are 3-wire external ignition ground type, like most Italian made US-model mopeds. Like many other US-model moped magnetos, the brake light is powered by the ignition source coil ground. This was to meet the US DOT requirement that the headlight not get dim when the brake light was on. 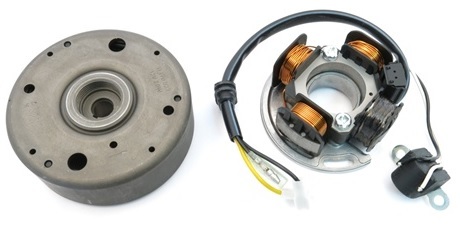 So the two-coil generator has three outputs, the black ignition wire from the points to the spark coil, the blue ignition ground wire that is grounded through the brake light or brake light switches, and the yellow light wire the provides 6V AC about 25 watts for light and horn. Early Tomos 1974 to 1985 had this type of magneto, with the brake light switches wired in series and normally closed when installed. If you removed the tail light and squeeze either brake, the engine would die. Starting in 1986 Tomos improved the electrical system with a solid-state-regulated single lighting yellow wire, a ignition black wire, and an internal ignition ground. So the engine never dies, on a 1986 and later Tomos with the 2-wire Iskra magneto, when the tail light wires are unplugged and the brake is applied. When the magneto type changed from 1985 to 86, the wiring also changed. These Ducati and ZEM 94mm complete magnetos will interchange with 90mm Bosch complete magnetos and other Bosch compatibles like Iskra, except for the width and position of the key groove that determines the ignition timing. They are counterclockwise rotation. Points are CEV type “right hand” (the brown part looks like your right hand sideways with fingers bent). Condenser is CEV type. Tomos mopeds have been equipped with many different magneto names and types. IDM magnetos, made in Italy, are on some early-to-mid-1990’s Tomos. They are CEV-compatible, and have the same appearance. The IDM 6411 magneto has a reputation of being faulty. The CDI ignition looses spark. When that happens, both the CDI-coil unit and the magneto assembly must be replaced. IDM 6411 (CDI) is on some 1993-95 Tomos models, especially 1993-94 Sprint. Three other magnetos were used during this period, IDM 6436 (points), Iskra 1217 (points), and AET 11.160.053 (CDI). Iskra magnetos are made in Slovenia (which was part of Yugoslavia before 1991). They are original equipment on most Tomos mopeds from 1989 to 2007. After about 1993 Iskra magnetos were labeled AET. Iskra electric motors, AET electric equipment and Tomos mopeds were (or are) divisions of Hidria, a family of Slovenian manufacturing companies. Iskra-AET magnetos have the AET logo stamped on the flywheel, and the Iskra name cast into the back side of the stator base plate. So they can be called by either name. Tomos mopeds, USA models, had many magnetos, but many were interchangeable. The magneto brands Ducati, ZEM, CEV, IDM, and Iskra-AET, each had different versions. They are all listed below, in order of VIN code and year range. This is an applications and identification list. None are for sale. Below this list is a separate list of Tomos magnetos for sale. In 1998 the 230.327 magneto changed to a “4-star” or “plus sign” design. 3 of the 4 coils were for lighting, connected in series, and one coil was for ignition. So the output wires did not change. The base plate screws changed, from three 4 mm, to two 5 mm. 1974-1997 engine cases had only mounts for 3-M4-screw stator plates. 1998-later engine cases had mounts for both 2-M5 and 3-M4-screw base plates. In 2003 the engine case, on all models, became electric-start-ready. The magneto did not change, but the magneto part number did because the rubber grommet for the wires changed. The 232.976 is a 230.327 with a different grommet. In 2001-02 the A35 Revival was the first Tomos with electric start. The 230.842 magneto was the same as a 230.327, except it had an extra wire for battery charging, and a large flat gear on top, for electric starting. In 2004-05 the A55 engine came out. It was cleaner and more efficient, to meet new 2006 EPA pollution standards. The A55 had a different magneto with an external pulser, which added two more wires. From 2004 to 2009, the A55 engine had AET 11.170.017 for electric start models, and AET 11.170.027 for non-electric start models. From 2010 to 2013 all models had electric-start type magnetos, with a ring gear and extra wire. But they were made by Kinetic and said 12V 60W. In 2014 new US EPA air pollution standards came out. That contributed to Tomos’s (actually Hidria’s) decision to quit selling mopeds in the USA in 2013. 37 years of continuous US-model moped production, 1976-2013, came to an end. Tomos continued moped production for the European market. In 2017 new US-model Tomos mopeds were once again being sold. Here are the Tomos magnetos listed by Tomos part number. Engine cases: You don’t have to know the year or model to know what magneto(s) fit at particular Tomos. You only have to know what left-side engine case it has. 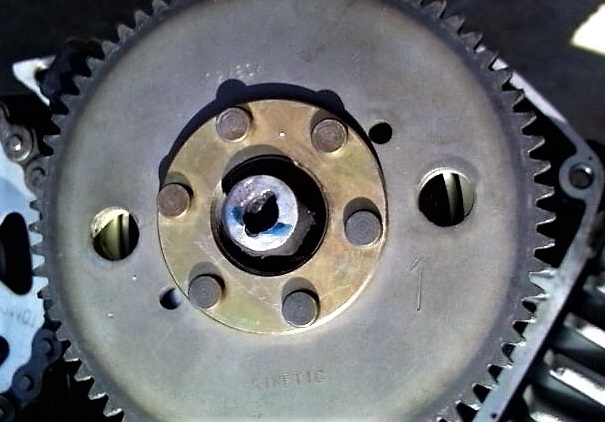 The stator plate has to fit the engine case, and the flywheel has to fit the crank. 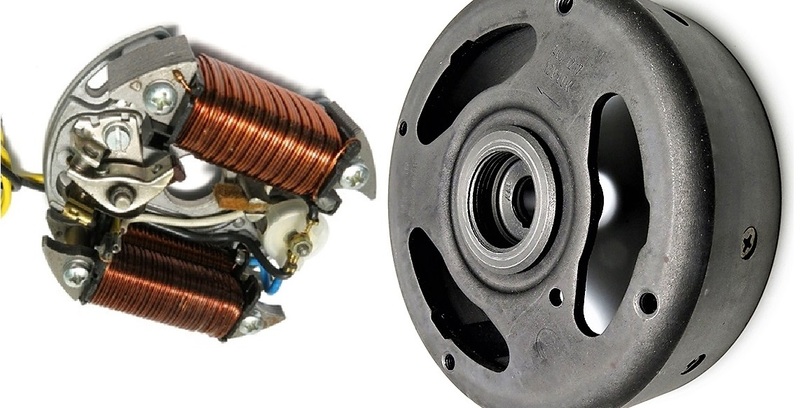 From 1974 to 1997 there were three M4-0.7 thread stator plate holes, for A3 and early A35. 3 total. From 1998 to 2002 two M5-0.8 thread stator plate holes were added, for mid A35. 5 total, 3 unused. From 2003 to 2013 two M6-1.0 thread pulser coil holes were added, for A55. 7 holes total, 3 unused. Flywheels: All the flywheels, both 80 and 90 mm ID, fit the same crank, but they can have different points cams or ignition triggers. Some flywheels do interchange, some might, and some don’t. Here is an image of the magneto section in the 1993 Tomos A35/Colibri Service Manual, by Tomos Products. You are currently browsing the archives for the Ducati and Iskra category.